IVG Colbachini has designed a new line of highly flexible silicone hoses, resistant to temperatures up to +200°C (+392°F) and with peaks up to +220°C (+428°F) for few minutes. This new product can be used in various sectors: from the automotive as connections in cooling systems or intercooler lines to the boat sector in different applications. It is resistant to hot air, fluids such as water mixed with anti-freeze liquids, and gas exhaust with traces of mineral oil. Hot Flexisil is available in three versions: cord (delivery only in accordance to the standard SAE J20 R1), hardwall with a smooth or corrugated cover (for suction and delivery, according to SAE J20 R2). Each version is able to suit different applications and flexibility needs required by the market. The diameter range is very wide and can be made in the IVG production departments in Italy in the following configurations: 60 meters (up to the I.D. 76 mm including) or maximum continuous lengths of 12 meters (for I.D. > 76 mm). 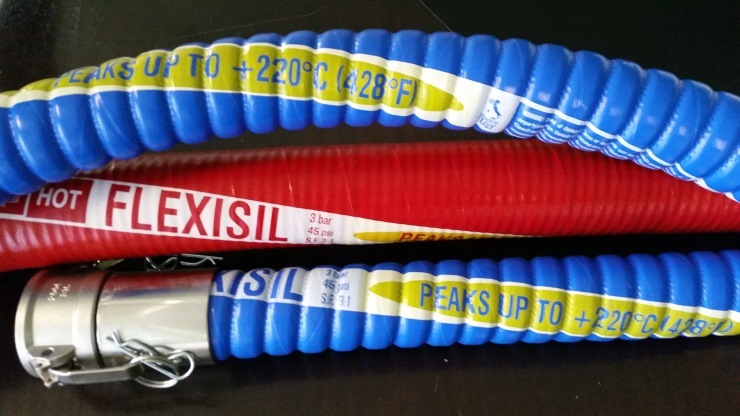 The new Hot Flexisil hose combines the excellent performance in use (made of flame retardant silicone according to ASTM C-542) to a renewed aesthetic appearance: the cover is bright, shiny, red, complete with a special branding that shows the hose properties. If you require a different color from the catalogue we are able to satisfy this request, however, by choosing the red version you are choosing IVG, the color of our brand that has identified us around the world for 50 years.